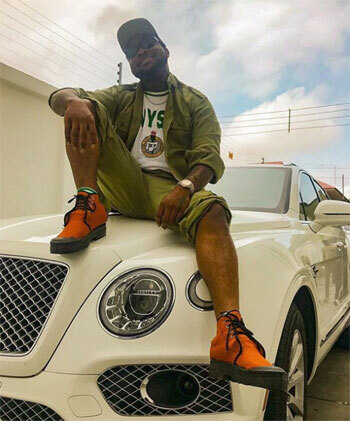 David Adeleke, popularly known as Davido, has come under fire for allegedly travelling to Boston for US Tour when he is supposed to be at the Lagos camp observing the mandatory 3 weeks orientation period of the one-year National Youth Service Corps, NYSC, scheme. So many Nigerians have however expressed pros and cons as to whether the “IF” crooner has flouted the Bye-laws guiding the NYSC, scheme with his travel. 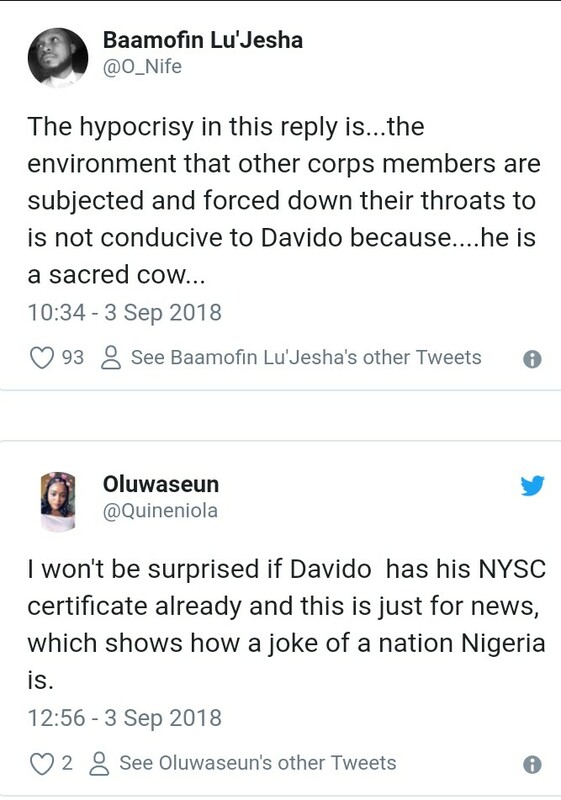 Davido, just last week Thursday, reported at the Lagos NYSC orientation camp at Iyana-Ipaja to conclude his registration, saying he was “tying up every loose end!” Many Nigerians had welcomed his decision to undergo the compulsory scheme which requires, especially for the first 3 weeks orientation period in the camp, that every corps member must stay in the camp and in the state. 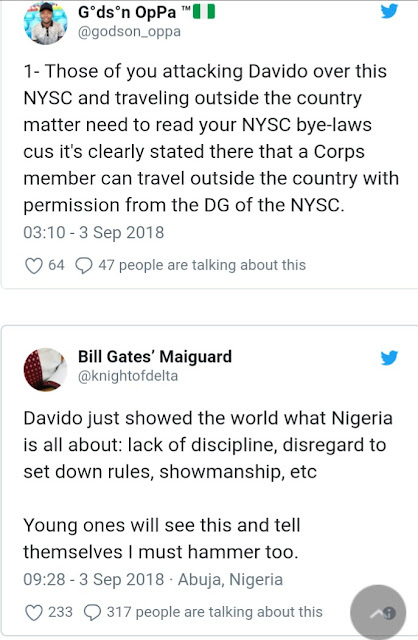 The bye-laws of NYSC states the following conditions for corps members during orientation period. 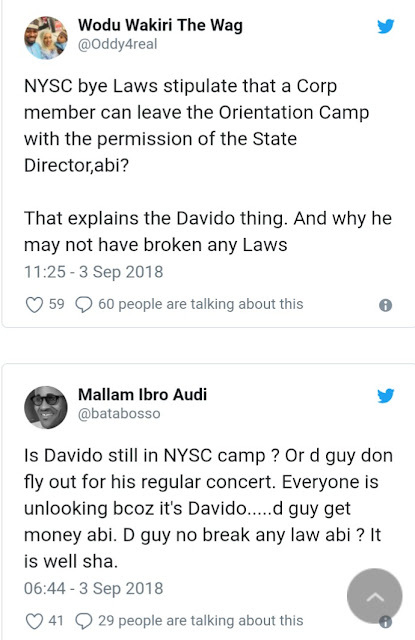 It states that, “”During the period of orientation, every member shall: (i) Attend regularly, punctually and participate fully in all official engagements on the field, at lecture and all places of work; (ii) Not leave the Orientation Camp or absent himself from any official activity without the written consent of the State Director or his representative; (iii) When absent from his duties on account of illness ensure that such absence is covered by an Excuse Duty Certificate issued by a medical doctor then on duty at the camp.” The bye-laws however stipulates that “Leaving the camp without permission of the State Director” will attract “extension of the service year by double the number of days for which the member was absent from his camp and forfeiture of his allowance for the same number of days of which he was absent.” However, just after his registration, Davido is said to have travelled out of the country to Boston for his ‘Locked Up’ U.S tour. This has, however, raised some arguments among Nigerians as to whether Davido was permitted to travel and or; whether or not he flouted the NYSC bye-laws. 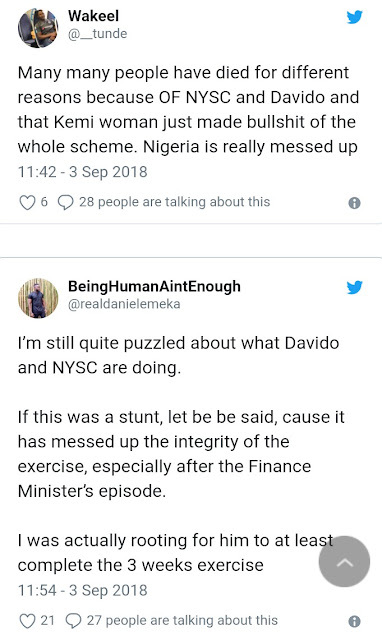 While some said he did flout the bye-laws, others said he did not.